For over 25 years, we manufacture high performance doors pet PlexiDor in our factory in Bradenton, Florida. Since the inception of our company, our team of product development working closely with pet owners worldwide to design robust products, safe, energy efficient and reliable, which will give many years of performance without problem. Freedom and peace of mind Your family will enjoy the freedom and peace of mind that comes with a high performance door pet PlexiDor. It will for example have to worry of damaging floors and carpets. She will also know that your pet has free secure access to the outside and enjoy the benefits of fresh air and exercise. Your pet will enjoy the freedom to relieve himself when he needs it, either while you are at work during the day or at will in the evenings when you relax at home. No more purchasing of spare flaps The pet door PlexiDor do not require costly replacement vinyl flaps. Their proprietary panels double glazing and shock resistant to open and close with a simple push and close automatically and tightly, without slamming. Each panel has been rigorously tested to ensure it can withstand the harshest outdoor conditions. The ultimate in energy efficiency Each PlexiDor is built with features designed to save energy. As the dual panel thermo shock resistant jointed with gasket industrial grade four sides – in up, down, left and right. The panels are designed to reduce the loss of air conditioning and heat. So whether you live in the hot climate of the Arizona desert or in the cold Alaskan glacial PlexiDor will save you money every month. Your pet will love the quiet, gentle and safe doors and you like to see a smaller electricity bill. Other safety The high performance door pet PlexiDor are provided with a lock, a key and a security plate steel. Just turn the key to lock the door at night. By prolonged or during vacation periods, install the safety plate steel. 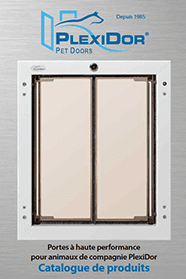 No other pet door offers the security of a high performance door pet PlexiDor. Color choices aligned with your inner PlexiDor offers three stylish colors to compliment your decor: silver, white or bronze. The white bronze finishes and inner and outer frames are cooked, providing more durability than the plastic frame or a painted surface. PlexiDor the door is by far the best that you can install in your home. Installing a door high performance pet PlexiDor you could reduce your electricity bill by up to 10%. Each time you open the door to let out your dog, and your HEATING AIR CONDITIONING escapes. This means that you climb your monthly electric bill! Installing a PlexiDor can save you! See the table below to determine your estimated annual savings. The above estimate is based on the following: An average temperature in spring and summer between 27 and 38 degrees and a cooling temperature of 22 degrees. An average temperature in autumn and winter between 0 and 7 degrees and an indoor temperature of 22 degrees. These results are typical owners PlexiDor doors and based on customer testimonials from around the world gathered for over 25 years. 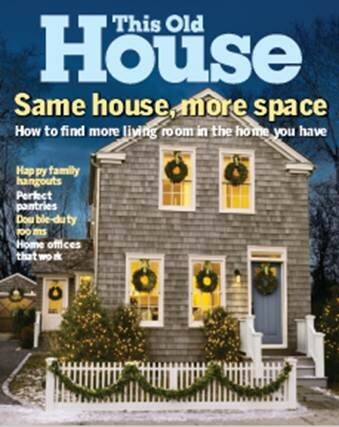 Actual results may vary depending on insulation, type of roof and windows, age and size of the house. The doors open and close easily Large or small pets can take the same door. The panels open smoothly from a slight push and close automatically. Robust springs are hidden in the main frame. The doors close silently, without slamming. They will not bother you and do not frighten your pet. Panels shock resistant and transparent The rigid, highly resistant and shock proof panels do not need expensive replacement vinyl flaps. The panels are insulated, tinted slightly while remaining transparent, creating a window for your pet. The ultimate in energy efficiency The panels are molded to form a double glazed insulating extremely effective. Both panels are covered on all four edges of the sealing velvet high density nylon seals for better eliminate air leakage. The doors close tightly to keep in the heat and air conditioning inside your home. You will reduce your monthly electric bill. Ideal for extreme climates! Sturdy frames tempered aluminum Made of anodized aluminum, the inner and outer frames do not rust, do not bend, do not crack and does not deform. Beautiful silver finish, white finish or bronze cooked. Extremely durable and looks great. Security Features: steel plate and cylinder lock Prevents the entry of intruders. Insert the key to lock or unlock the door. Install the safety plate steel for a longer time. Cats up to 10 kg / 24 lb and dogs up to 4 kg / 9 lb. Made from a single panel, the door PD SMALL opens from left to right smoothly and accurately. Even the kitten or the smallest puppy can easily open a flare All four edges simply high strength acrylic panel bearing the same seal velvet high-density nylon industrial grade that large doors, offering the same energy efficiency. The spring lock 4-position can be set to INPUT ONLY OUT ONLY ENTRY AND EXIT or LOCK. Simply turn the knob to activate. The PD SMALL doors do not comprise safety plate steel. Dogs up to 18kg / 40lbs Your family and your pet will enjoy the freedom and peace of mind that comes with a PlexiDor door. You will for example more to worry about damaging floors and carpets. You also know that your pet has free secure access to the outside and enjoy the benefits of fresh air and exercise. Your pet will enjoy the freedom to relieve himself when he needs it, either while you are at work during the day or at will in the evenings when you relax at home. 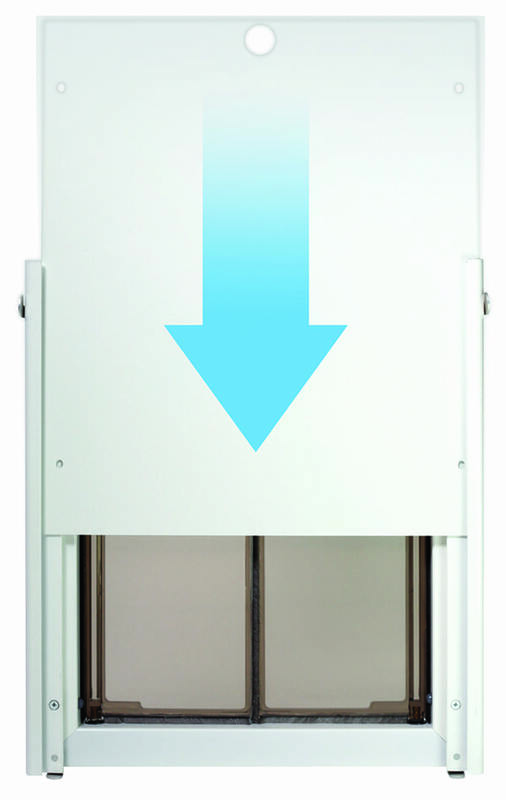 Dogs up to 45kg / 100 lbs The pet door PlexiDor do not require costly replacement vinyl flaps. Exclusive panels double glazing and shock resistant to open and close with a simple push and close automatically and tightly, without slamming. Each panel is covered on all four edges of a seal snugly velvet nylon industrial grade high density in order to best eliminate air leakage. When closed, the panels reduce the loss of air conditioning and heat. So, whether you live in the hot Arizona desert or in the cold Alaskan glacial PlexiDor will save you money every month. Your pet will love the quiet, smooth operation and security doors; As for you, you will relish the drop in your electric bill. Dogs up to 100 kg / 220 lb. Signs of PD and PD WALL DOOR XL XL PlexiDor doors are made of a sheet of 9.5 mm (3/8 inch) high solid acrylic rather than insulating glass resistance. They are virtually indestructible and by large dogs up to 100 kg (220 lb). The panels are also provided with a border in the test of aluminum biting factory installed around and on both sides of each panel. Aluminum edging prevents dogs, especially large breeds, damaging the panels nibbling. Suitable for dogs to 57kg / lb and 125 all cats. If you are looking for the ultimate in convenience and security of door pet, be aware that electronic door PlexiDor PDE is the choice of pet owners worldwide. 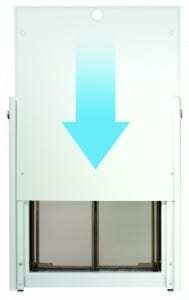 The composite panel slides vertically like an electronic mini-garage door and serves as a security door between uses. With a radio frequency identification technology advanced, the sensor reads the preprogrammed code to open and close automatically to your pet only, without letting other animals. The waterproof key weighs only 11 grams (0.4 ounces) and is attached to the collar of your pet. The opening time of the door is adjustable. The door PlexiDor PDE plugs into a standard outlet or ordinary can be wired. Easy to program and even easier to use, it will give you satisfaction, your family and your pet for years. Quality, fit and professional finish WALL PD units can be installed in walls timbered, brick, or cement blocks up to 30 cm (12 inches) thick. Each wall unit includes a tunnel that connects the aluminum inner and outer frame. The materials it is made provide a professional finish and fit that enhance the look of your home. The PD WALL PlexiDor unit will not rust, has no sharp edges and is easy to clean. Innovative and useful applications slides lock flap accessory plate steel safety Means you are away for a long time or are looking for more security in everyday life, slides simplify your task. Simply attach the left and right rails to the inside of the inner card, then drag the safety plate steel. Attach the plate with the lock flap practice and voila. The slides are made ? ?of strong and durable aluminum. Choose from colors silver, white or bronze and medium, large or extra large sizes. The necessary hardware is included and they install in minutes. 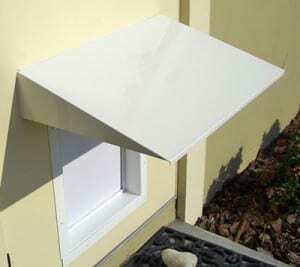 Canopy door pet The awning PlexiDor prevents rain, sun, snow and wind to enter through the pet door. This attractive and durable canopy is made of aluminum baked finish. Universal size, suitable for PD DOOR units, PD WALL, DOOR PDE and PDE WALL. Dimensions: 59 cm (23 1/4 “) deep 42 cm (16 5/8.”) Wide. Available in white (item: AWNING WH) or Bronze (article: AWNING BR). Installation instructions are included with each unit. Si vous n’êtes pas pleinement satisfait de votre achat, retournez la porte à votre distributeur et il vous remboursera le prix d’achat au complet. Les frais d’expédition ne sont pas remboursables. Les portes PlexiDor sont couvertes par une garantie résidentielle limitée de 5 ans. Toute pièce défectueuse sera réparée ou remplacée sans frais; les frais d’expédition de base pour réparations sont compris pendant 5 ans à partir de la date d’achat. La main-d’oeuvre n’est pas couverte. La production d’une porte pour animaux de compagnie sécuritaire pour vous et votre famille est notre souci premier. Chaque porte comprend une serrure, une clef et une plaque de sécurité en acier rendant pratiquement impossible toute intrusion dans votre maison. Les unités PD DOOR et PD WALL de PlexiDor comprennent une serrure et deux clefs. La serrure comporte une came en acier à l’intérieur d’un cylindre en métal trempé. 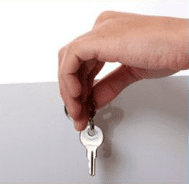 Tournez simplement la clef pour verrouiller ou déverrouiller et pour empêcher les intrus d’entrer dans votre maison. La plaque de sécurité en acier est comprise avec chaque unité PD DOOR ou PD WALL et peut être installée avant une absence prolongée. Si vous utilisez la plaque de sécurité au quotidien, procurez-vous les glissières à verrou à rabat PlexiDor pour plus de commodité. Quelles sont les différences entre une porte à rabat en vinyle et une PlexiDor? Le rabat des portes à rabat en vinyle (« rabat garde-boue ») doit être remplacé quand il est usé, parfois une fois ou deuxfois par an. Il peut jaunir, se dessécher ou se fendiller, puis tomber en morceaux. Certains chiens le mâchouilleront. Chaque rabat en vinyle de rechange coûte entre 10 $ et 100 $, selon la taille et le fabricant. De plus, la plupart des portes à rabat fixent le rabat sur le cadre en plastique au moyen d’aimants. Or, si le rabat rétrécit sous l’effet de la lumière du soleil, les aimants risquent ne plus se toucher et de ne pas sceller l’ouverture correctement, ce qui augmentera le coût de chauffage et de climatisation de votre maison. Est-ce qu’une porte pour animaux de compagnie menace la sécurité de ma maison? La porte PlexiDor comprend une serrure et deux clefs, ainsi qu’une plaque de sécurité en acier. Vous pouvez verrouiller la porte de l’intérieur à votre guise et installer la plaque de sécurité en acier avant une absence prolongée. Fait d’aluminium trempé, le cadre intérieur et extérieur de la porte PlexiDor ajoute de la force à l’ensemble et rend l’intrusion pratiquement impossible. La petite porte PlexiDor pour les chats et les petits chiens de jusqu’à 4 kg (9 lb) ne comprend pas de plaque de sécurité, puisque son ouverture est si petite qu’il ne laisse passer aucun intrus. PlexiDor fabrique également un jeu de glissières qui se visse dans le cadre intérieur pour faciliter la mise en place de la plaque de sécurité en acier. Où puis-je installer une porte pour animaux de compagnie PlexiDor chez moi? Les portes PlexiDor peuvent être installées dans les portes, les murs ou les portes-fenêtres coulissantes. Les unités murales peuvent être installées sur un mur de jusqu’à 30 cm (12 po) d’épaisseur et comprennent un tunnel en aluminium qui relie les cadres intérieur et extérieur. Si vous possédez déjà une porte pour animaux de compagnie d’une autre marque, il est fort probable que l’ouverture déjà découpée puisse servir à l’installation de la porte PlexiDor moyennant de légères modifications. Mon chien aura-t-il du mal à apprendre comment utiliser la porte PlexiDor? La plupart des animaux y parviennent entre 5 secondes à 5 jours. Pour aider votre animal à s’habituer à la PlexiDor, ouvrez-la d’un côté ouvert et attirez-le de l’autre avec une friandise. Répétez la manoeuvre quelques fois, puis fermez le panneau et attirez encore l’animal à quelques reprises. Pour les chiens, il faut généralement compter moins de 20 minutes. Les chats peuvent mettre un peu plus de temps. Chez le chat, une autre motivation consiste à placer de l’autre côté de la porte PlexiDor un objet qu’il veut, comme son bol de nourriture ou sa litière. 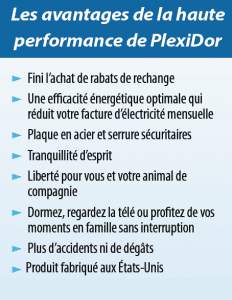 Par quelle garantie les produits PlexiDor sont-ils couverts? 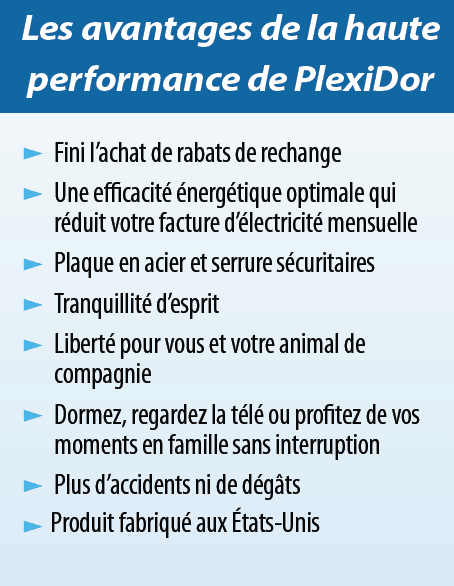 Les produits PlexiDor viennent avec une garantie de 5 ans et un remboursement garantie sous 90 jours. Si vous n’êtes pas complètement satisfait de votre achat, renvoyez le simplement au revendeur où vous l’avez acheté et il remboursera le prix d’achat complet. Les frais d’expédition ne sont pas remboursables. Aurai-je un jour une pièce à remplacer sur une porte PlexiDor pour animaux de compagnie? Tous les 5 à 8 ans environ, il faudra remplacer le joint d’étanchéité de qualité industrielle. Selon la taille de la porte PlexiDor, les trousses de joint se détaillent entre 25 $ et 35 $. Une trousse suffira pour les deux panneaux des portes de style saloon et s’installe facilement. Les produits PlexiDor sont fabriqués à Bradenton en Floride. En cas de problème, il est facile de se procurer des pièces de rechange.